If you love social media you've probably discovered Pinterest already. But do you know how to get the kind of traffic that just keeps on giving. 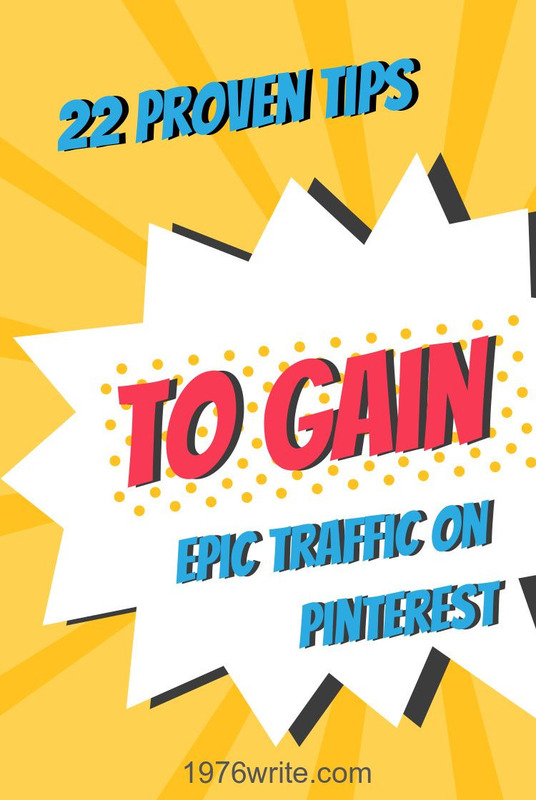 In order to shine on Pinterest you need a strategy that works, a plan that will put you at the top of the list when it comes to your traffic. 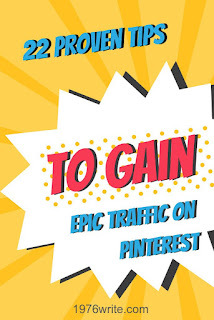 This post will show you 22 tips on how to get to the top of the pile on Pinterest. Give people a reason to follow your profile by providing a professional profile that shows that you mean business. You want as many people viewing your pins as possible, your followers will know how important your profile is by the amount of effort and time you've put into it. The more followers you have the more chance of them stumbling across your pins in their feed. This is why its important to have a professional profile, otherwise you risk being followed by spam accounts. How Do You Prepare Your Pinterest Profile? If your running your blog as a business it makes sense to sign up for a Pinterest business account. It's free to create a business account and it's an easy change over if you already have a Pinterest account. It's your decision which suits your blog or website best. Make sure that your avatar or photo is clear, you don't want to leave a bad first impression. Ensure that all of your social media accounts follow the same branding, this let people know that you mean business. Don't just use your blog name. Use this to tell your audience what your blog is all about. Use your blog name then pick 2 to 3 keywords that will let your audience know what your Pinterest account is all about. 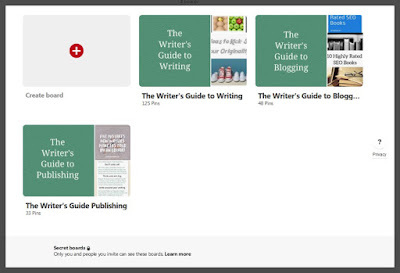 1976write's Pinterest name includes "A Blog About Writing" attracting like-minded writers and bloggers. This is your opportunity to grab the people that are looking for something particular in your area of expertise. It's also a chance to add a free download if your blog has one. Choose 2 to 3 keywords and include them in your description, then add the link to your chosen landing page. This should be one of the first things you do when you fill in your settings page. People will stumble upon your blog and naturally will want to have a look at what you do. If you're connected to Facebook or Google+ connect your accounts. It's another opportunity to show people the other platforms you're active on and gives them the excuse to follow you, which is a good thing. People love following boards on Pinterest, especially boards that are relevant to their likes, interests and provide them with pins they want. Most people think that Pinterest is all about creating hundreds of random boards and sticking any pin on them. You need to put together boards that are curated with appropriate information taken from your blog and other bloggers in your niche. Aim for about 15 boards with at least 10 pins on them. If you're finding that some of your boards are becoming neglected because you can't find the right pins then delete them. Remember your boards need to be appealing to all those interested in your particular subject. If people don't like them they won't follow you. If you're really stuck start delving into what your competition is doing. What boards do they have? And copy their boards. You'll notice a lot of the same named boards, but the difference is you want your board to stand out from the rest. Pinterest will automatically put your board in "other", you don't want this if you can help it. You need to pick a category that's the closest to your chosen niche. Most bloggers put their blog into "education" because they're teaching people something new, so choose a category that's the closest to your niche. It's easy to make your boards more personal than specific, you need to find names that are keyword rich and will show up in Pinterest search results. People prefer to find whole boards full of pins that interest them. Again this is very similar to your profile description, you need to think of words people will be looking for in your category. You need to hook people up with a readable board description that grabs them at first glance. By default Pinterest will choose the first pin on a board and use it as a cover. You want your Pinterest profile to look professional, which is why Pinterest gives you the option of choosing your own board cover. Your ideal board cover matches and blends with your website or blog. I kept my covers really simple and minimal, but you can be as a creative as you like. Check out my post 3 Great Reasons to Use Fotor for inspiration on image creation. Quick tip: Use these dimensions to create a board cover 750 x 1120. This board will house all of your blog or websites images this should be the first board everyone will see. This is a thought many Pinners use, but there is a downside to creating a home board, you're creating duplicate pins which Pinterest doesn't like. So be careful on this one. Always put your best boards first, these are the boards that cover the most popular topics and present content that is to your audience. Join boards that are like-minded and in the same niche as you. This will also boost your blog traffic tremendously and give you greater exposure. Your boards are the guts of your Pinterest profile, your images are the nuts and bolts and the pins people will most interact with. Your competition will be pretty fierce but not impossible to conquer. Provide your visitors with something that's worth looking at. Spend time and give your images some thought when you produce them. Pinterest will accept almost any size image, the optimum size is 735 x 1102 or you could use a template from an online image create such as Fotor or Picmonkey where they'll provide you with blank templates or pre-made templates to use on your board. It's certainly true that horizontal pins get overlooked. You could try using different sizes but again that all depends on the style of your blog or website. Use a text overlay on your image, they tend to fair much better than blank pins. People like to know the ins and outs of everything so give them an eye catching banner. You want to gently entice your audience in, and make them want to click on your content. Care about what you pin, curate the content that matches with your blog mission statement. Don't just save anything on your board. Always create content that is worth clicking, take time each week to pin and keep your branding in mind every time you Pin on Pinterest. You're followers will expect a certain theme or colours to run through your boards so give them want they want to see. This is an amazing and secure way to ensure that your pins automatically show information directly from your website. It also helps branding, and makes your profile look more authentic and official. You need to prep your site for your blog visitors, creating easily shareable buttons so that they can add your pins on Pinterest. You can get the HTML code from Pinterest, this is pretty easy to follow, and if you're really unsure about adding code check out some videos on Youtube to guide you. You need to start creating a plan of action otherwise all of the above work is for nothing. Pin consistently, so it becomes second-nature, people will start expecting new pins on the days you choose to Pin. Incorporate this into your weekly blog routine and it won't seem like a chore when you do it. Set-up a routine that suits you and pin everytime you create new content. Add pins from other Pinterest users and start building your boards.